The audience who gathered in Regional Theatre, Thrissur, Kerala on 28th March 2019 to watch Yaami: The homophonic woman consisted of students, activists, avid film goers, and lovers of documentaries, besides the usual crowd of dance enthusiasts. Shruthi Namboothiri, a filmmaker noted for soul searching productions is the light that illumines the hidden longings of Yaami. The dance drama is an amalgamation of Bharatanatyam and contemporary dance numbers, theatre, music, and literature. On the stage that represents a house we see a housewife, blindfolded, moving like a puppet triggered by the male voice and children lisping 'mammy...' She is Yaami, a Sanskrit word meaning Kulastree, a creation of patriarchy down the line. There are times when she removes her blinds. But then the gaze is turned inward, revealing the hidden world of her subconscious. And the surreal zooms into focus. In four segments, four famous women characters created by celebrated male writers pop up narrating the familiar stories. The twists in each highlight another angle. The result, a feminist critique of iconic characters, a saga created from a unique perspective! Malyagandhi of Mahabharata gives the Indian point of view, as old as the epic that has evolved through millennia in our consciousness. In the dance-drama the ironic dimension is implicit. The fisher woman who ferries the boat falls a prey to the lust of a sage. He is such a great Yogi who could create snow to hide the act. The sequence does not narrate the story, but points to the resultant experience in her psyche. The smell of fish, an inalienable part of her body is peeled off. It is the loss of her identity. Her struggle to accept the new sanctified smell of her body vibrates in tragic intensity. Desdemona of Othello by Shakespeare, is another woman, a rebel who dared social norms. She left her home to follow the dictates of her heart. She left her home with a dark-complexioned Moor. The stories of runaway couples are part of human history. However the world beyond the woman, cannot attest to her authenticity. The handkerchief from the original text soars like a powerful symbol that smothers and drives women to commit suicide as a means of liberation. In the dance drama, however there is a twist. Desdemona rejects the mischief of the handkerchief. She throws away the choking, stifling lace to remain alive and united in love. Eliza Doolittle (Pygmalion) created by Bernard Shaw represents the downtrodden in society. Her language betrays her class. Learning the language of the genteel society is the gateway to high society in the play. But, here in the process of transformation, Eliza realizes the loss of her true self. In revolt she goes back to her original home, the street, as a flower-seller speaking the language of the gutter, to assert her identity. The onslaught of higher castes on marginalized communities is introduced as another angle of perception in Malyagandhi. Racial prejudice becomes an underlying theme for Desdemona in the dance drama. Social division based on class is another factor that humiliates and disgraces women, as in Eliza's return to the street. Nora as in the original text comes out of 'A Doll's House' constructed by Henrik Ibsen. She finally emerges as the emancipated woman. And we find both the author of the play and the director of the dance drama, come out pointing to the need for a feminist stance. Nora, a married woman, is not Yaami. She leaves her home to fulfill the mission of her life. The father too has to play his role in bringing up children is the implicit message. That the woman too has a mission in her life is the point to note, a philosophy to accept is the core of the production. The mode of presentation of Yaami is unique. 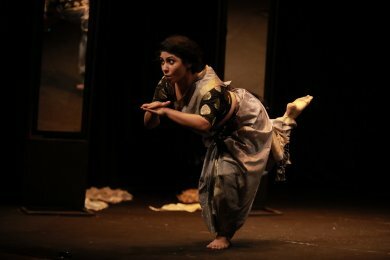 With text and direction by Shruthi Namboothiri, dancer Tanya Saxena uses a combination of Bharatanatyam and contemporary dance format to bring out the different components of the theme. Music plays an important role to underscore the shades of grey. The thanam mode of singing of Carnatic classical music is evocatively used to present the humdrum existence of the home maker. For, thanam has no lyrics, only repetition of certain syllables. The music embodies the same dull rhythm of Yaami's existence, resonating her heartbeats. It also links the turbulent sleep-walking segments, juxtaposing the lackluster existence of a housewife submerged in her chores. Music composition by Sudeep Palanad to the accompaniment of violin and sarangi helps to create the appropriate atmosphere for the evolution of the theme. 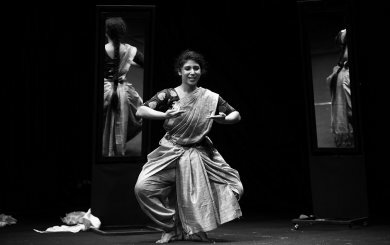 The monologue rendered highlights the evolution of the psyche of Yaami through the four characters into a full-fledged theatrical character. Stage setting by Benni is in sync with the multiple shades of associations. The use of six mirrors, reflecting and refracting, changing into windows and finally as the exit for liberation, enhance the complex theme. Their painted sides pointing to the world of literary characters help to integrate the theme, under the lighting of Jose Koshi. However, Yaami does not rise to the level of Shruthi's 'Baale, an Anthem to Womanhood' in creative luminosity. It may not communicate to an audience unfamiliar with Othello, Eliza Doolittle and Nora. As an experimental production it promises great future for Shruthi and her team as well as for Janabheri International Theatre, based in Thrissur, Kerala. Padma Jayaraj is a freelance writer on the arts and a regular contributor to www.narthaki.com.